The global fashion company is joining the growing list of smartwatch retailers this fall. It’s a day of smartwatch announcements. 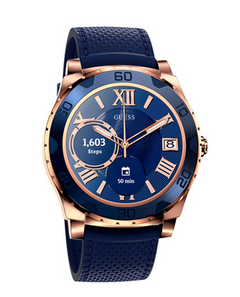 Guess is throwing its fashionable hat into the smartwatch ring with the Guess Connect, an Android Wear 2.0 smartwatch slotted for release later this year. The brand currently sells smartwatches that are just Martian devices rebranded as the Guess Connect. The watches feature a static notification bar that syncs to the wearer's phone. The updated Guess Connect watches will instead run Android Wear 2.0. The Qualcomm Snapdragon Wear 2100 processor (which is becoming fairly common for AW 2.0 watches) will sit at the heart of the watches. All other specs at this time are unknown, but people interested in buying a smartwatch from a fashion company like Guess probably aren't overly concerned with tech specs. The Guess Connect is the latest in a growing list of smartwatches from non-tech oriented companies. One has to wonder how successful these devices will be; companies like Fossil and TAG Heuer are betting big on a waning wearables market. However, it may just be these companies that see success; by marketing smartwatches to “regular” consumers who are less obsessed with tech, they may be striking into an untapped and lucrative market. The Connect will come in eight styles, five of which are specifically designed for men. Potential customers can expect the watches to hit the market this fall.